Joseph Yoakum was born on a Navaho Indian reservation in the Arizona Territory to a family of twelve children and raised on a Missouri farm. He received only six months of formal education, and at age fifteen he joined the circus. After working for several circus groups, he decided to leave the country and travel around the world as a stowaway. He returned to the United States for a brief period and then went to Central and South America. During World War I, he was stationed in Clermont-Ferrand, France. Years later, in 1962, Yoakum moved to Chicago where, inspired by a dream, he created his first drawing. For the next eight years he drew constantly, using a combination of ink, graphite, watercolor, and colored pencils. His subject matter was an exploration of the landscapes he had experienced in his youth. 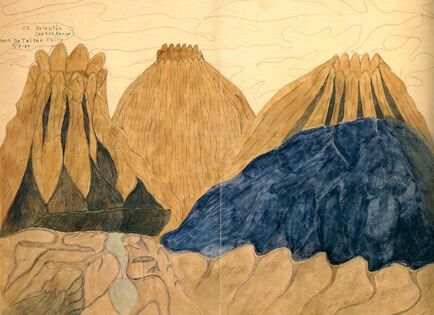 He called this process of combining imagination with memory “spiritual unfoldment.” He drew delicate, richly patterned scenes of hills, mountains, roads and seas. He worked in a storefront on Chicago’s South Side and hung his completed drawings in the window. They were noticed by a Presbyterian minister who ran the café at the University of Chicago, and he organized a show there; this brought the work to the attention of gallery owner Ed Sherbyn, who gave Yoakum an exhibition. The artist gained the respect and admiration of the Chicago artistic community. In 1972, he was honored with a posthumous exhibition at the Whitney Museum of American Art in New York.